My gullible self immediately thought our trip leaders were serious when they opened our training day with this line … for my easily persuaded friends out there, missionary doesn’t actually translate to “flex” in Latin. Although they were facetious, their words served as a forewarning of the travel woes to come when our 6:00 p.m. flight to the other side of the island was cancelled without reason, rescheduled for 4:00 a.m. the next morning, and we didn’t have a hotel room to stay in because we’d checked out that morning. Did I mention everyone was emotionally, physically, mentally, and spiritually drained from spending five days in a knock-out, drag-out fight for the gospel? So what do you do in a foreign land when your flight is delayed for no apparent reason? 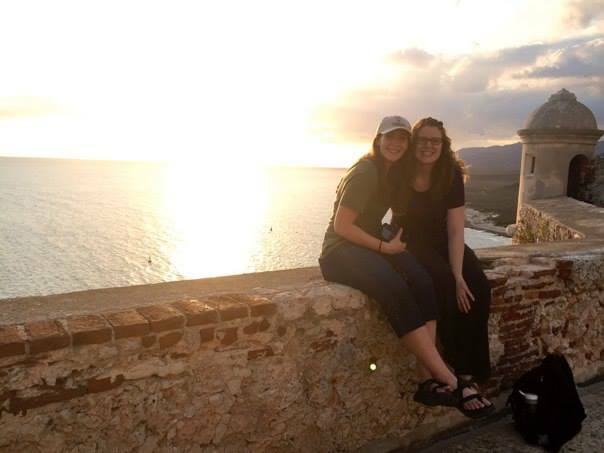 At our first stop, we explored the nooks and crannies of a 400-year-old fortress and watched the sun kiss the Caribbean waters goodnight. Then we climbed to the third floor of a home/restaurant for a coast-side dinner and laughter hour where delirium kicked in and a few teammates lost their mental marbles. Around 9:30 p.m. we headed back to the airport to waste time and rest in the lobby before our 2:00 a.m. flight check-in … only to find out the airline conveniently forgot to mention they provide complimentary hotel rooms for situations like ours. We laid our heads down for about 2.5 hours before our alarms went off at the ungodly hour of 1:00 a.m. and we headed back to the airport in hopes of making it to our day’s destination (enjoy this glamor shot to the left). Our flight remarkably left on time and we landed in the country’s capitol at 6:30 a.m. After another 4-hour catnap at the hotel, we headed out for a day of touring one of the most vibrant and historic cities I’ve wandered in my short 23 years of life. In retrospect, I’m glad airlines in developing countries don’t get uptight about canceling a flight. I trust there was a divine reason our initial flight didn’t make and the Lord gave me another opportunity to work on my patience. The way I see it, it was a win-win. It turns out this being flexible thing isn’t so bad after all.